Adjust oven rack to lower middle position and heat oven to 350 degrees. Using fork, poke thicker half of each breast 5 or 6 times. Place on wire rack set inside rimmed baking sheet and season each breast with ½ teaspoon salt. Refrigerate, uncovered, while preparing coating. Pulse nuts in food processor to coarse meal, about 20 pulses. Melt butter in 12 inch skillet over medium heat and cook, swirling pan constantly, until butter turns golden brown and has nutty aroma, 4 to 5 minutes. Add shallot and ½ teaspoon salt; cook, stirring constantly, until just beginning to brown, about 2 minutes. 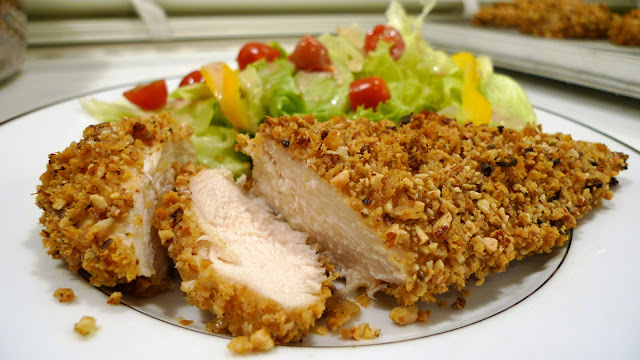 Reduce heat to medium low, add panko and ground nuts, and cook, stirring frequently, until golden brown, 10 to 12 minutes. Transfer panko mixture to shallow dish or pie plate and stir in lemon zest, thyme, and cayenne. Lightly beat eggs, mustard, and pepper together in second shallow dish or pie plate. Place flour in third shallow dish or pie plate. Pat chicken dry with paper towels. Working with 1 piece at a time, dredge chicken breasts in flour, shaking off excess, then coat with egg mixture, allowing excess to drip off. Dredge chicken in panko mixture, pressing gently to adhere. Transfer breaded chicken to clean wire rack set inside rimmed baking sheet and repeat with remaining chicken. Bake until chicken registers 160 degrees, 20 to 25 chicken. Let rest for 5 minutes before serving with lemon wedges. End. Nut Crusted Chicken Cutlets with Lime and Chipotle: substitute 2 teaspoon grated lime zest for lemon zest, reserving lime wedges for garnish, and 1 teaspoon chipotle Chile powder, ½ teaspoon ground cumin, and ½ teaspoon ground coriander for thyme. Nut Crusted Chicken Cutlets with Orange and Oregano: Substitute 1 teaspoon grated orange zest for lemon zest, reserving orange wedges for garnish, and oregano for thyme.